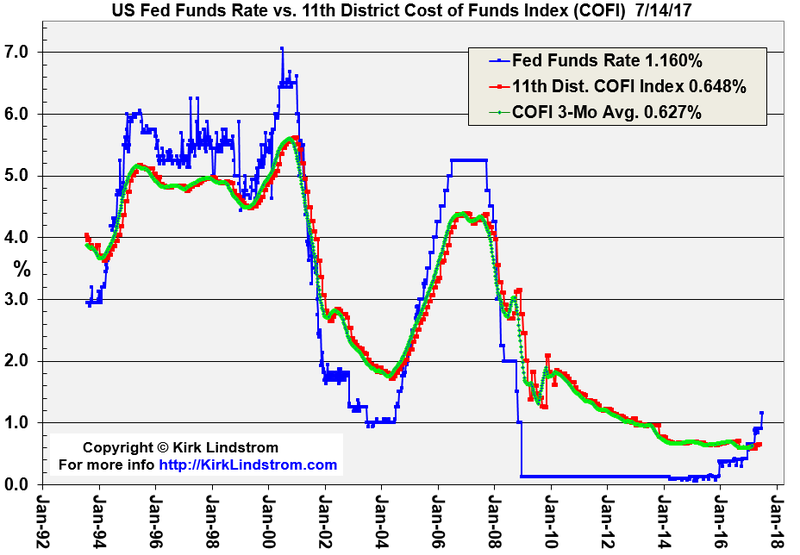 This graph shows the US Federal Reserve Funds Rate plotted vs. the 11th District Cost of Funds Index (COFI). 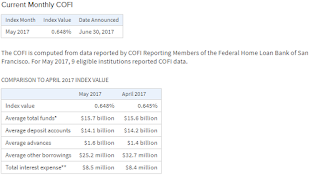 COFI is an important index for setting interest rates for home purchases and refinancing. 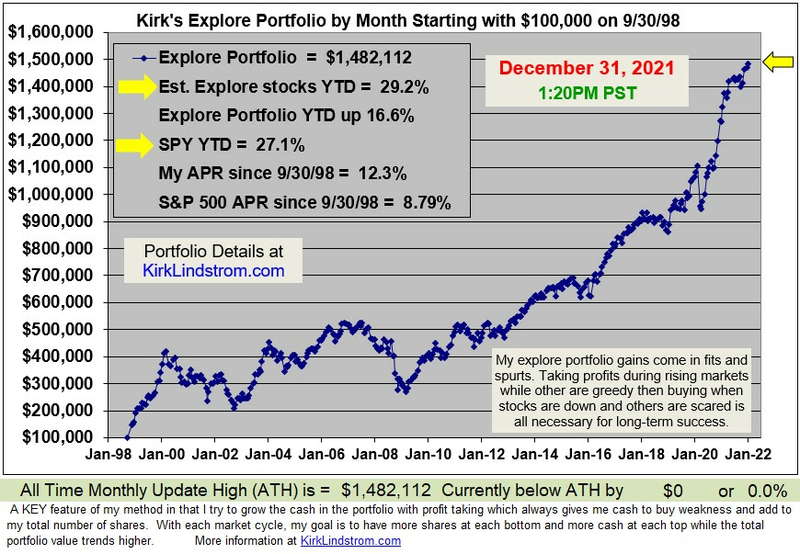 "The 11th District Monthly Weighted Average Cost of Funds Index (COFI) is one of many indices used by mortgage lenders to adjust the interest rate on adjustable rate mortgages. 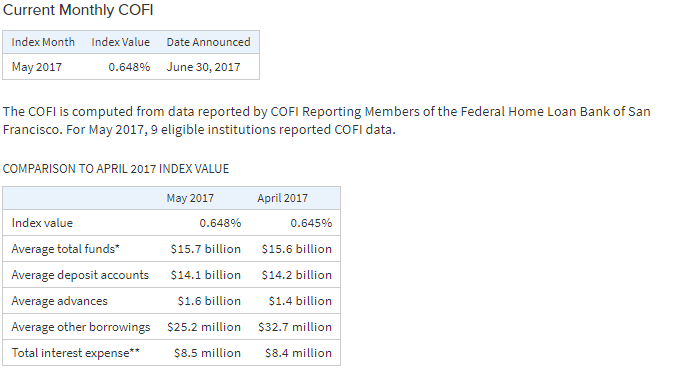 The COFI is computed from the actual interest expenses reported for a given month by the Arizona, California, and Nevada savings institution members of the Federal Home Loan Bank of San Francisco (Bank) that satisfy the Bank's criteria for inclusion in the COFI (COFI Reporting Members). 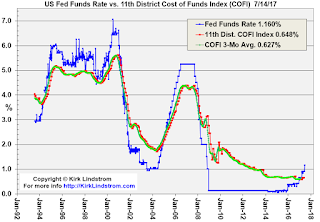 In addition to the COFI, the Bank publishes semiannual weighted average cost of funds indices for California and the 11th District, which are based on the interest expenses of applicable COFI Reporting Members from January through June and July through December each year." Subscribe to my newsletter service NOW and get the July 2017 Issue for FREE! ! Your 1 year, 12 issue subscription will start with next month's issue.